Forbidden City or Great Wall may be the places of greatest historical importance in Beijing, but regarding beauty and diversity nothing can match Summer Palace (颐和园; Yíhé Yuán). Summer Palace complex covers over 290 hectares and it was built in 1750 by the Emperor Qianlong. Since then it represented the imperial residence until the death of the Empress Dowager Cixi in 1908. It is the biggest imperial palace in the country, even four times larger than Forbidden City. Within the palace, there are a large lake and water canals where you can take boat rides. You can also enjoy beautiful walking paths, and the most famous Painting Gallery, which is made in the form of 728 meters long hall with a ceiling painted with images of flowers and pearls, symbols of China. Another symbol of the palace is certainly Marble boat – boat of white marble in the shape of a dragon. In the Summer Palace, there are many rooms with the unusual and beautiful interior. The Pavilion of the Fragrance of Buddha is one of them, though there are many more. Summer Palace also has a very rich collection of art and applied art, which are quite authentic, yet more recent than those in the Forbidden City. When you go through the building, it is impossible not to notice flowers that are made of precious stones in various colors. Despite all the destructions to which Summer Palace was exposed in the past, it still preserved some of the very nice items from the early days of Chinese art. Among them, one of the most appealing is bronze vessels for incense sticks, which are almost 30 centuries old. The newer buildings attract attention with their beauty and artistic value. December 1998 was the time when Summer Palace became a part of UNESCO’s World Heritage List. Though the majority of the complex went through the awful destruction during the Second Opium War, Summer Palace still stands firmly and attracts millions of tourists a year. Near the entrance is info office, luggage store, and audio guide rent (CNY40; CNY100 deposit is required). Free wheelchair can be loan at the entrance. 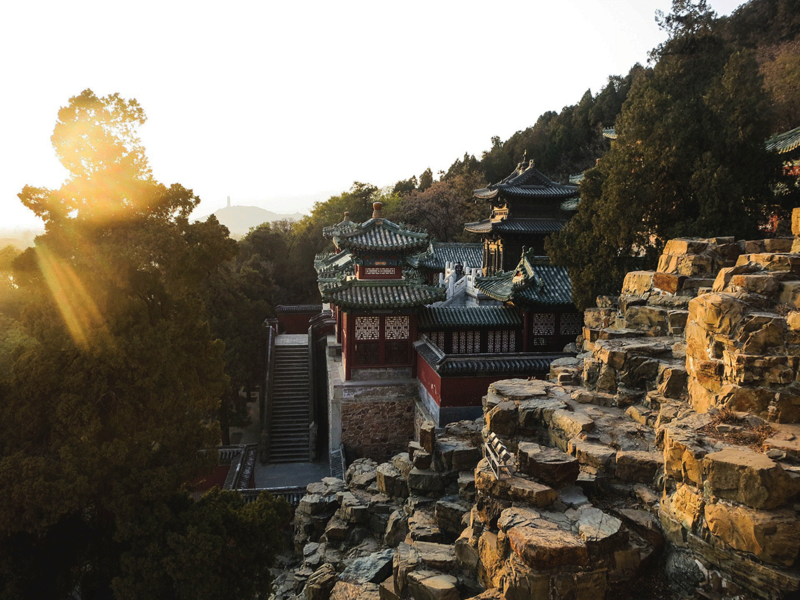 Some parts of the Summer Palace, such as buildings on the top of the Longevity Hill, are not accessible for the people with disabilities. Also some sections of paths on the food of the Longevity Hill and around Kunming Lake are not wide enough for the wheelchairs. There are restaurants within the Palace, most of them with fast food. Light refreshment and toilets are also available. In front of North Palace Gate are stalls with cheap, but delicious traditional Chinese snacks, so it is better option to supply with food and drinks just before you enter the complex. If you would like to spend more time in exploring Kunming Lake there are small boats for renting (CNY40). You can choose between regular and through ticket. Through ticket include admission to inside attractions. If you chose a regular ticket, you can still visit inside attractions, but admission should be paid: Suzhou Street & Hall of Serenity (CNY10), Tower of the Buddhist Incense (CNY10), Garden of Virtue and Harmony (CNY5), Wenchang Gallery (CNY20). In some areas photographing and filming is forbidden.